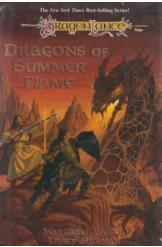 Dragons of Summer Flame from the Dragon Lance Saga by Margaret Weis and Tracy Hickman, hardcover, 552 pages. The summer will be deadly. Perhaps t will be the last summer Ansalon will ever know.